In mid-January, I walked through Suigetsu Park. The trees were all bare and if it weren't for the blue sky, it would have been really gloomy. Then at the beginning of February, I went back and noticed that the momo/ume (peach/apricot) blossoms were starting to bloom. There was even someone who brought her pet rabbit with her to the park while she photographed the blossoms. The robai (a waxy flower) ro = candle/wax, bai = apricot was also in bloom. I really like this flower because it has a strong fragrance. I didn't know about this but there is also a little pond for fishing. There were several men/women fishing, I wonder what they were catching? Whatever it was the sign nearby said that they weren't allowed to use lures. When I got to the park, more momo/ume trees had bloomed, including this weeping type. It was a beautiful day. Today is the last day of February. Spring is coming...I can't wait! I'm bummed, I just heard that the department store that I go to buy the ficelle apertif from is closing in August. It is true that I don't always go, it is sort of out of the way, but whenever I am in the area, I like to pick up something from them. Oh well, at least I have until August and maybe someone will bring them into their department store. Richart is a pricey chocolate from France. They also have a shop in Tokyo and were at the chocolate fair for Valentine's. I didn't realize it but these bon-bons are tiny, less than an inch squared, but the flavors they pack are huge...well, most of them anyway. The Petit Richart set was reasonably priced so I got the No.1 set. Caramel Coulis (top left)--caramel filling covered with dark chocolate. Green Tea (bottom right)--no green tea taste...rather disappointing. Darcis is a Belgian chocolatier. His bon-bons were simple and delicious. Passion--passion fruit ganache covered with milk chocolate, the passion fruit flavor grew as you ate this....nice. Caraibe (far right)--milk and dark ganache covered with dark chocolate. This was a little smoky, but delicious. Rigollot, another MOF, came out with these macarons for Valentine's day. The top of each macaron had a dark chocolate disc and was marked with the letter of each flavor like an acrostic poem of sorts. My favorite was apricot because it had bits of apricot in the butter cream filling. The one that was a disappointment was rose, it was a fake rose flavor, too perfumy. This ends my chocolate adventures (for now). Hope you enjoyed them, let's get back to the kitchen and other adventures. UPDATE: I just read that Darcis has opened a boutique in Osaka. Let's end this post on a happy note...here are the chocolates/cakes that Satoshi received from his co-workers for Valentine's. one was even called "mahalo" which means thank you in Hawaiian. Mac, Maku-do, Mickey D's, whatever you call it the ones here just came out with the quarter pounder with cheese and the ginormous double quarter pounder with cheese. I don't usually eat here but couldn't believe that it wasn't on the menu until this year and went to check it out...does it usually come with 2 slices of cheese? I was kind of peeved that the onions weren't diced, made it hard to eat (you can see it sticking out of the bun). McDonald's also has an upscale shop called McCafe. The ones here only have soft serve and coffee. We tried the chocolate dipped cone and a coffee flavored soft serve. The dipped cone reminded me of Dairy Queen, but bigger. A friend on Flickr who lives in France, posted the macaron that she got at her McCafe...I'm totally jealous. Do you have a McCafe where you live? What special things do they have there? How is the weather where you are? We've been having some gloomy weather--clouds, winds and rain. Being from Hawaii, I really think I need some sun to generate energy within myself. Anyway, we saw this eclair on a television program. This eclair has custard and whipped cream. It is called the W cream eclair...and it is only 150 yen (about US$1.50). It isn't too sweet, probably from the dark chocolate on the outside. If you are in Japan, you can find it at Family Mart. Be warned though, it is quite popular and I've heard that some Family Marts have sold out. Last Autumn, we found out that our favorite ramen shop, Momofukutei would close and that Ippudo would take it over. We went once in December, but I didn't have my camera. We were glad to see that they kept the two types of ramen that were Momofukutei's specialties. Momofukutei's had a point card but with the new management they changed their system, so to "make up" for doing away with the point card, we received a card for one free ramen. Last month, we went to eat the free ramen, but couldn't get in, so we went back a couple of days later, when Satoshi was off on a weekday. Satoshi had their Akamarukasaneaji--a huge bowl filled with tonkotsu soup, a little red miso (I think), green onions, kikurage (wood ear) and half of a soft boiled egg. He also ordered their mentaiko gohan. This comes with a nice serving of mentaiko (salted pollack roe with chili), rice, nori (laver sheets) and tsukemono (pickles). We shared an order of their hitokuchi gyoza (bite sized pot stickers). Actually, I just ate two pieces and Satoshi ate the rest. This comes with a little dab of chili paste. The toppings (char siu and soft boiled egg) come on the side with some spiced rice and nori (laver sheets). The rice is seasoned with chili, but a different type from the broth. If you weren't perspiring from the soup, you will be after eating the rice. So, far we've enjoyed what we've tried from here. We'll be back. Awhile back La Fuji Mama sent me a dark chocolate covered marzipan loaf because as she wrote in her note, "I just couldn't stand the thought of you never having tried marzipan before", she is so sweet! Apparently the Japanese customs must have thought it was some kind of weapon though because they opened the package. I enjoyed the marzipan, the ground almond and sugar paste had a hint of cherry flavor and sort of reminded me a little of coconut too. It was covered with dark chocolate, balancing everything out. Thanks again for being so kind La Fuji Mama! 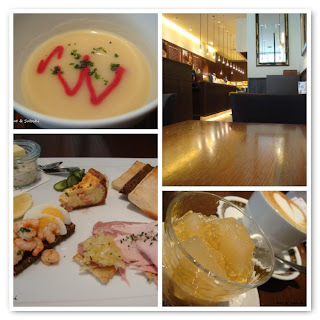 After French class on Tuesday, I went to the Hilton Plaza to check out the Ig Cafe for lunch. 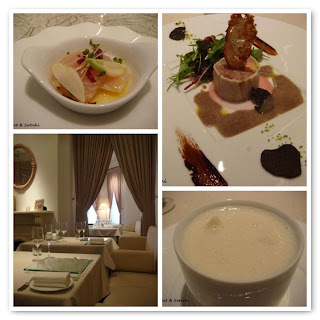 The chef, Hiroshi Yamaguchi is also the chef at the Kobe Kitano Hotel. He has several bake/sweet shops named Igrek (French for the letter "Y") or in this case just "Ig". The Ig Cafe serves lunch and dinner and also has a take-out menu. I was surprised that the cafe wasn't crowded during the lunch hour. I chose Lunch A 1600 yen (about US$16), which was a combination of the Norwegian "smorgas" and French "tartine"--which I understand both are open-faced sandwiches. Lunch started out with some soup (potato and beet), loved the flourescent swoosh of beet in the soup. A salad and then the open-faced sandwiches. You can pile condiments onto your toast or just eat them on the side. There were marinated shrimp, hard boiled egg, pickles, pork, sauerkraut, butter & homemade tartar sauce(in the jar). I loved that they had different types of breads too, multi-grain, pumpernickel, not the white bread that you would normally see in Japanese cafes. The lunch also came with dessert, a caramel pudding topped with pear and gelatin. Just enough sweet from the pear and gelatin and the caramel pudding a little bitter but the whole thing balanced. Since the lunch came with a drink, I chose the cappuccino. Though the cappuccino art was kind of lacking (sorry it wasn't pretty), the crema was really good. Alain Rolancy, an MOF, partnered with Saladino Bruno, another chocolatier and opened a shop in France called Ambiance et Chocolat. The chocolates I tried were Miel (left)--honey flavored ganache covered with dark chocolate. I really liked the deep honey flavor. Guanaja (right)--was a 70% cacao ganache covered with dark chocolate, was a little bitter but still delicious. Christopher Norman, a chocolatier from the U.S. teamed up with Bel Amer in Tokyo and came up with these chocolate bon-bons. Super Dark (left)--a dark ganache flavored with rum and then covered with dark. I loved the design on the chocolate, so cute! The rum flavor was light so it didn't overpower the chocolate. Apple Pie (middle)--a puff pastry bottom with a white chocolate, cinnamon, caramel apple mousse on top...it really did taste like apple pie. Pecan Nut (right)--was a almond hazelnut praline cream and roasted pecans covered with milk chocolate. Most candies in Japan use walnuts (I've never even seen pecans in the stores here) so it was nice to see pecans being used. I loved the cute "cut-out" chocolate hearts he had as decoration. For dinners, I've been cooking more recipes from "The Foods You Crave" book. One night was the "salmon with sweet and spicy rub". I used sashimi grade salmon, mainly because I was lazy and didn't want to bother with picking/pulling out bones. The salmon came out really moist, tender and delicious. I served this with "asparagus with lemon and tarragon". She suggests nuking the asparagus, but I steamed mine. This was a good match since fish is usually served with lemon. Another recipe I tried was "salmon cakes with ginger-sesame sauce". Since I only had a can of smoked halibut, that is what I used. The halibut was firmer and smoky in flavor, (because it was smoked) so the cakes were a bit dry. Still, it was an easy recipe. Also, I didn't make the ginger-sesame sauce and instead made her "smarter tartar sauce" since I didn't think the ginger sesame sauce would match with the smokiness of the cakes. I served this with steamed broccoli and the lemon and tarragon dressing, the same dressing as the asparagus. I think this dressing would work with steamed beans or actually any warm vegetable. Since I only made half the recipe of the salmon cakes, I had one egg left in my carton. As I flipped through the book, I noticed that her recipes for muffins makes 12 with 2 eggs, so I cut the recipe in half and made 6 muffins with my last egg. The muffin recipe I tried was the "apple-pecan muffin". The recipe calls for applesauce and buttermilk. I didn't have applesauce and wasn't going to buy (or look for it at the store) or make it, so I instead subbed some yogurt in place for both the applesauce and buttermilk. I also didn't have wheat flour, so I added some ground flax. The muffins had just a touch of sweetness from the apples and topping. It was perfect for breakfast. I hope to try even more recipes from this book. You can find most of these recipes on the Food Network site. I'm guest blogging over at La Fuji Mama's today. She's not feeling too well...to find out what this picture is about head on over to her site. Hope you feel better soon, LFM! On Friday the 13th, I met my host-mom for lunch in Kobe. She took me to a fancy restaurant inside of a historical home. She said that she found the restaurant through my foodie host-dad. Apparently, he went on his own and had lunch here, then told my host-mom about it. Graciani is a French restaurant located in the Ijinkan area of Kobe. The Ijinkan area has homes of foreign consulate generals and commerce traders from the Meiji period which are located on the hillside of Kobe. Most are not used as homes anymore but have been transformed into museums or cafes. This particular restaurant was the home of the Gracianis, a french trader and his wife and is over 100 years old. Our lunch started with some kanburi (winter yellowtail) carpaccio. And a sausage of gibier (I think this was a type of sausage made with wild game), all I know was that there was a LOT of black truffle shaved onto it...yum. Next came a creamy cauliflower soup with crab in it. We though the bowl was deep but it was actually very shallow. 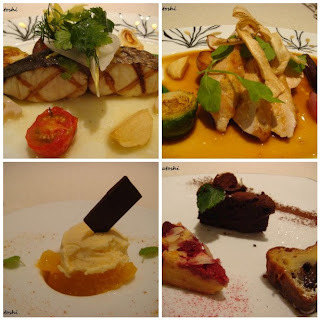 We chose two different main dishes, so we could taste everything--a grilled sawara (spanish mackerel) and a yuzu (citron) sauce and roasted pheasant with a shoyu sauce (soy sauce). We both agreed that the sawara was moist, tender and delicious. Next came the palate cleanser, but this seemed more of a mini-dessert. Vanilla ice cream, mandarin oranges and gelatin at the bottom. Dessert was a slice of warm plum cake (more like a plum pudding), raspberry cake & gateau chocolat. My favorite was the plum cake. We ordered some herb tea, I think it was either lemongrass or verbena. 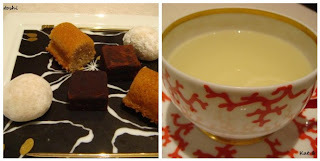 And at the end of our meal, they brought out mignardise (russian tea cookie, truffle & a piece of caramel cake). Despite it being Friday the 13th, it was a great lunch, nice sized portions, and we had a nice time chatting. Back up to the 4th, I went to Umeda to check out the chocolates at the department stores. I went with the intention "only to check out the names" of the chocolates for Camprini, but ended up buying some chocolates, actually 6 different things. So, here are the first two. A la Reine Astrid is a French chocolatier that has a shop in Tokyo. They didn't have a chocolate map of their bon-bons, so they let me take a photo of the descriptions that was in their showcase. Mirabeau (top left)--a tonka bean praline with milk chocolate. This one had a heavy hazelnut flavor. Pale Argent (top right)--Dominican cacao with a dark ganache, there was hints of berry and some tobacco. Lamoignon (bottom left)--roasted almond hazelnut paste, I liked the roasted flavor really deep. Lady (bottom right)--caramel ganache + gianduja, nice caramel flavor. Serge Alexandre is a Belgian chocolatier who has a shop in Japan (Fukuoka). I loved the packaging, it was an origami bag. Open it up and there were the two bon-bons. Praline Pistache (left)--almond paste, roasted pistachios with dark chocolate. This had a nice roasted flavor. Le Coeur Chocolat (right)--a raspberry dark ganache covered with white chocolate--the flavors were balanced. Friday the 13th the weather was weird. Really warm, in the late afternoon it rained and didn't stop. It rained so hard that my slippers on the lanai were soaked and when I opened the front door, water dripped from the door jam. I wanted to post about some new things at Starbucks. In some areas of Tokyo, I've heard that the Earl Grey Tea Lattes have sold out, which is sad because the ones I've gone to still have them. On a recent trip, I tried their Orange Honey Latte. This is made with espresso and orange flavoring. My friend, T, said that it reminded her of those chocolate oranges, you know when you whack them against something they break into orange slices? I totally agreed with her. They also have churros, but I didn't get a photo of it. I'm glad they heat it up for you, but sad that they heat it up so much that it sticks to the waxed paper they put it on and then you can't get the waxed paper off when you eat it. The parts I did eat were good though. At the convenience stores, they have this out now too. It is called Bruxelles...dark chocolate and coffee, how can you go wrong?